He is a man with a vision. He is the epitome of a gentleman: talented, insightful, dignified, humble-and far from simple. He's the style guru to most recognisable faces in the country. Having started his career in the tailoring and fashion industry straight out of school, there were many he looked up on to learn the beautiful art he has now mastered, one of whom being his father and grandfather who he deems his mentors. 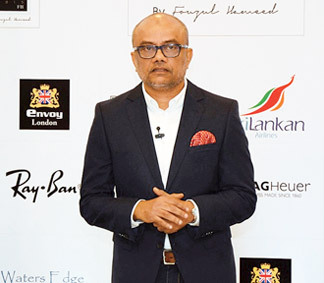 Having overcome many obstacles Fouzul Hameed, the moghul of menswear in Sri Lanka established the name Hameedia which one could call as the one and only menswear brand making a name of its own. 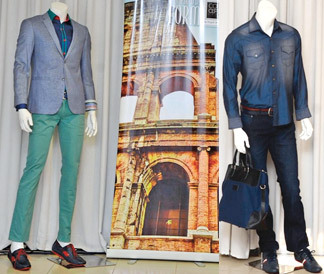 The Concept 2015 show was set to further enhance the Sri Lankan men's fashion arena and uplift the FH brand to international standards. 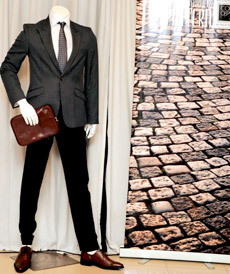 The Collection which was showcased at the event es over 60 years of tradition, know-how and expertise . 'Concept 2015' was my dream. I always dreamed that every man should be a gentleman. I believe that a should be a man in the truest sense of the word. . The 'Concept 2015' show revolved around that ideal. The way someone is dressed defines their personality and this show is all about showcasing the extensive range of clothing that we create for men. Q: First of all if you can talk more about the recently concluded Concept 2015 and its purpose? 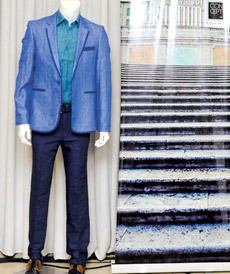 A: It's an exercise to take exclusive FH menswear to new heights and it's the second edition of annual 'Concept' show. Concept 2015 showcased nine Collections, which include the Blue Story, a Printed look, Denim look, Italian look, Indoor Western look, Fusion look, Formal look, Power Dressing look, and Ceremonial look. 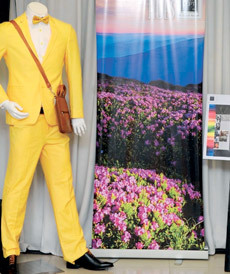 Most of them were inspired by European architecture and the colours of nature, the show was forecast fashion trends a year in advance, allowing men to be more aware of the trends they need to lookout for and use to dress for different occasions. Q: Hameedia came a long journey in the apparel industry since 1925. If you could recall how Hameedia evolved into the current position in the industry? A: It's a family business, my father took over the business from my grandfather and at that time my grandmother sold a piece of land and gave the money to my father to develop the business further with the vision to looking after the poor people of the village. Still the same motto is carried by the company. Q: Was that a conscious decision that you made to step into the fashion industry when you were young? A: No it was not. I had to choose this as my career path because I didn't have any other choice. Before I joined my father's business, I tried several jobs but none of them worked for me. However, I always had a dream to make a brand of my own. So I think god showed me the correct path to achieve my dream. Q: Talking about Sri Lankans, as a nation do you think we are fashionable? A: We are getting better due to internet and various other social media networks. Although women are quite keen on their fashion trends, men are quite opposite to them. However things are getting better and compared with those days, today there are a lot of men we see who pay a lot of attention on their clothes and fashions. Q: What is the magical formula for your success? A: I always want to cater the best for my customers. I never believe in making money through lies. That was the first lesson that I learnt from my mother when I stepped into the business and I'm strictly following her lesson throughout my career. A: Yes I'm. I respect every religion and I believe that if a human doesn't follow a religion we are equal to animals. All the mess in this world is due to not being believers. We are full of ego and do not care about other's feelings. Q: Do you have a role model in life? A: My mother is my role model. I learnt a lot from my father who's no more with us. But I consider my mother as my role model because even though she has never been in school, the lessons that she taught me from her life is mesmerizing. The biggest lesson that I have learnt from her is the simplicity of living. Q: As you have visited many countries in the world, which nation influenced you the most? A: I love Japanese who are honest. I I learnt a lot from them. Also I learnt a lot on fashion things from Italian people. Q: What was the hardest decision that you have taken in your life so far? A: Fantastic question! Fifteen or twenty years ago we used to buy lot of materials from third parties. Lot of retailers cheated us by selling cheep stuff claiming that those are branded materials. I too as not so experienced and bought and sold cheap stuff for years assuming we were selling number one quality goods. With foreign exposure I realised those were fake. Q: What's the motto in your life? A: Work hard, earn well and do best to society. Q: Being a busy businessman, how do you manage stress? A: I actually enjoy the stress. So I love to have a little stress all the time. I play soccer every other day and exercise which gives me a balance to life. Most importantly I pray, which heals my soul. Q: What is the most advantageous quality which is associated with your character? A: I think I'm quality conscious. I think it is quality which drove me to this level in the industry.